What’s your favourite colour? Do you think it says something about your personality? I like lots of different colours myself, but my actual favourite is grey. If you mix all the colours of the rainbow, they actually mix to become white. – true when LIGHT is mixed, not PIGMENTS. I’m such a geek. Anyways, my fave is blue. agree with darrhel. my fav is Purple!!!!!!! Yep yep, white is all the colors of the rainbow mixed together, black is the absence of color. Thank you highschool art class, haha. That’s only true when light is mixed. My favourite colour is rainbow too. Don’t they become white if you blend them all over one another with coloured glass disks or something…? I think mixing the actual paints makes black (or possibly brown). Anyways, this one is quite funny Thanks for sharing! Oh, and my favorite color is blue. Edd’s right, it some greenish kind of brown. But hey, it doesn’t really matter for the comic what exact colour is used in the last panel, right? 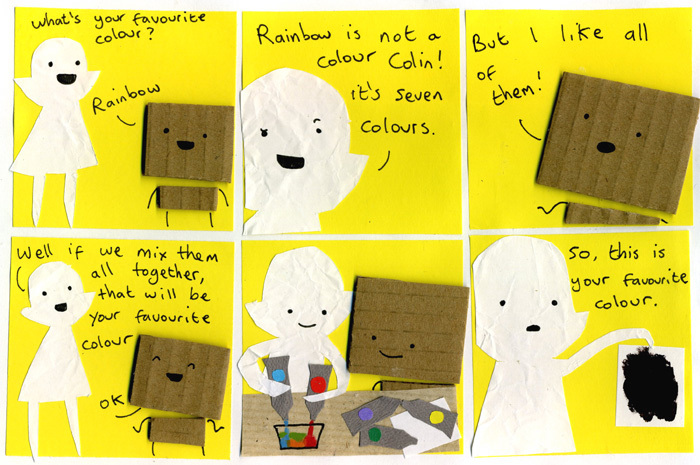 I like Colin’s innocent face in the third panel. If you mix all the colors of the rainbow in LIGHT you get white. If you mix all the colors in the rainbow in PAINT you get a slimy brown-almost black. Love it! This is very accurate. The mixture of light (as in a rainbow) is accurately represented by the mixing of red green and blue light. When 100% of Red Green and Blue are mixed, you get white. An example of this is with a prisim. White light is shown to the prism, and it splits this color into its multi-colored rainbow components. Light mixing is known as an additive color model. How’s that for more than you ever cared to know about this subject! I found this comic on Stumble upon, gave it a thumbs up, made this comment and moved along! My favorite color is tie dye. My favourite colour is orange, always been and always will be. When you mix pigments you actually get brown. Green. It’s the best, I agree with Tsuji. My favorite is Yellow. it is…..epically amazing. Grey is also my favourite colour (fine, shade), especially charcoal and deep greys. All you colour-likers are just sheep. Cool kids are into shades, man. Shades. I don’t think colors should say anything about your personality. My favorite is green. I also like orange, pink, white, brown, and gray. And I’ve been going through a yellow faze recently. I just think they’re pretty. They shouldn’t mean anything, darnit. If you mix light you get white, that’s subtractive and additive colours. My favorite color is ice cream. My favourite colour is orange. It’s been for like 9 years now .. It used to be blue when I was a kid. I dunno whether it says something about personality, maybe it does, maybe it’s just preference. I was out for a walk the other day at a park and thought, “this is why green is the best, it’s everywhere! !” anywho, clever comic!! I always say, everything turns to brown in the end. i thought everything turned grey in a dark dank depression. i like sapphire and heather grey. i’m very specific, i know. YELLOW! Not bright bright yellow more of a buttery yellow is my fave. Hey! Oh my god! You’re the first person I’ve ever met (besides my self) that has grey as their favorite cool!